It's that time of year again! 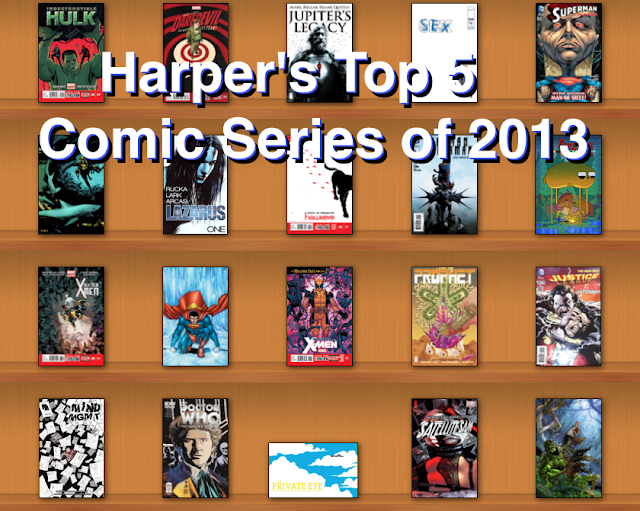 This week we're celebrating our favorite comic series of the year. 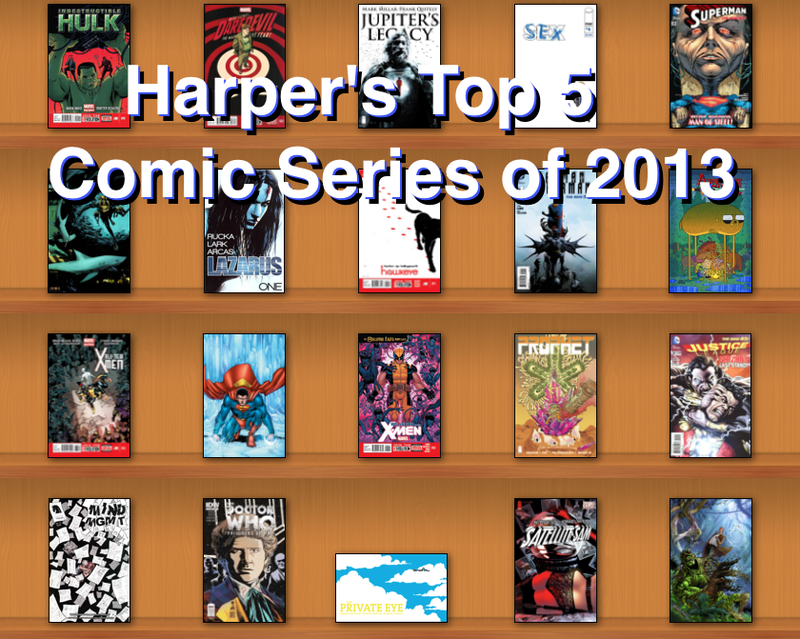 Kyle, Shane, and I will count down our top 5 comic books of the year with a little explanation why we think each one deserves such a prestigious compliment! 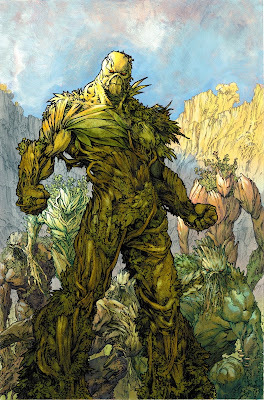 This one didn’t start out strong: the first three issues of Swamp Thing in 2013 were the end of the seemingly endless Rotworld arc by Scott Snyder. I’m a big Snyder fan, but his biggest flaw has always been that he tends to stick to one concept for a very long time, 18 grueling issues in this case. We were left with a change in the status quo as Abigail Arcane became the avatar of the rot. 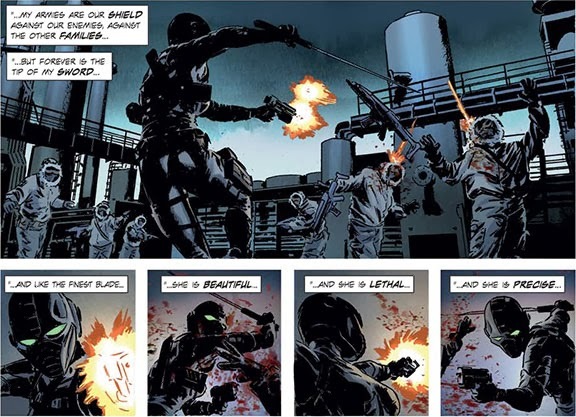 Enter Charles Soule, the relatively unknown writer. 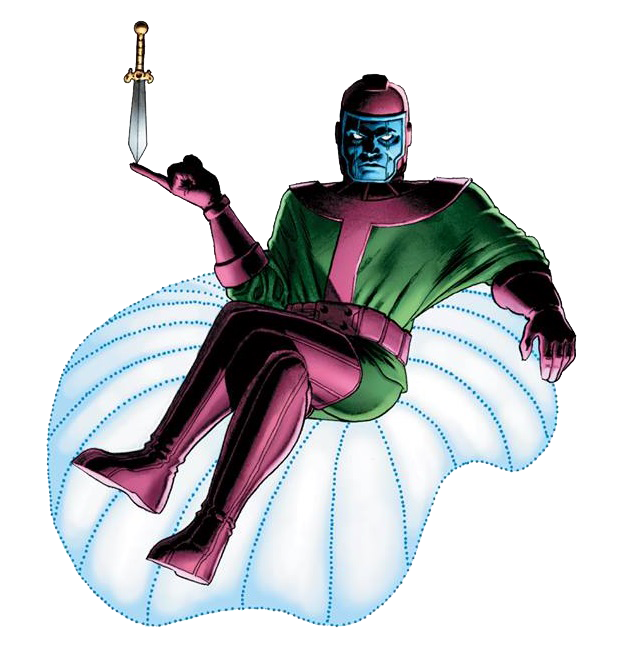 In a stroke of genius, he sets the stage for his story with a series of short, two-part stories that were fun and reminiscent of Moore’s legendary run on the character. Now having moved the pieces into place, he has begun to tell a unique tale that weaves the mythos of the green through both age old warriors and a very human Swamp Thing. Soule is now on all sorts of big name books, and Swamp Thing is the reason why. I hated Infinity. It was confusing, long, and remarkably dull. Thankfully Marvel has seemingly given Rick Remender and company their own corner of the Marvel Universe to play with, 100% separated from the Hickman-verse. Spinning out Avengers vs. X-Men (the only good thing to come of it, I say) and his own Uncanny X-Force (my favorite series from 2011), this story of a united mutant/Avengers team has been the most epic and emotional read of 2013. This year saw the exodus of Cassaday from the book, who was unfortunately not in top form, and gave us a few artists to take his place, largely the very capable Daniel Acuña. From the assassination of a celestial, to the destruction of S.W.O.R.D.’s Peak, from the resurrection of friends lost and secrets revealed, to the most recent issue’s tragic misunderstanding, this book has been one of both the smartest and most action-packed series of the year. 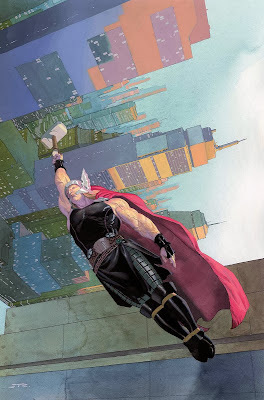 I’ve never read a Thor book in my life. That is until Jason Aaron and Esad Ribic put together this incredible series. What could have been a forgettable story with a lame villain (Gor the God Butcher) quickly became the talk of the comics world with its epic scale (both in terms of time and space), surprisingly charismatic villain, and its sense of humor despite its very dark tone. Past, present, and future Thor must unite to battle the being that has enslaved every god in the universe--what could be more fun? What’s especially on display here is the breathtakingly gorgeous art by Ribic: the cosmic vistas, planet shattering punches, and horrified facial acting are absolutely without parallel. This team somehow managed to craft a story that was deeply grim while maintaining an undertone of humor and fun--who can resist young Thor swinging around a space shark by the tailwhile present day and future Thor defend their space-faring viking ship stocked with (never enough) mead? I know, I know, another book with only four issues! But this one cannot be ignored. Dropping into the comics world out of nowhere in March, this was a big deal: Brian K. Vaughan and Marcos Martin, hot off of Saga and Daredevil, self-published a new series online in digital-only form, which is not just DRM free, but also pay-what-you-want. Picture this: a future in which ‘The Cloud’ burst, revealing everyone’s sordid secrets, meaning privacy is now of the utmost value and everyone has secret identities. 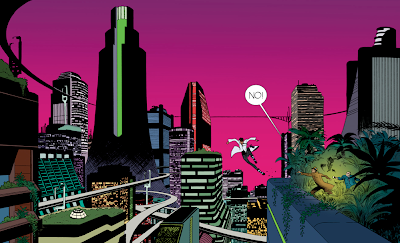 In this colorful metropolis is our titular P.I. who, in classic noir fashion, gets involved with a beautiful woman who’s in with some bad people. 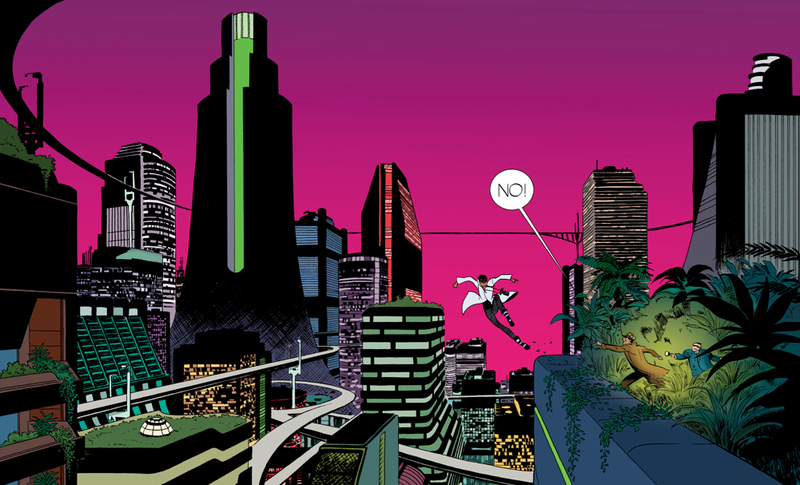 The story is fresh and intriguing, and Martin’s art is absolutely stunning. It’s by far the comic I get the most excited about, and the fact that each issue comes out without warning makes it that much more thrilling. I chose this as my #1 not only for those reasons, but for the fact that two of comicdoms most consistently fantastic creators have put out a fun and gorgeous book that has me, someone who has virtually never read a digital comic, voraciously poring over the PDFs. Absolutely wonderful! What do you think? Do these books not cut the mustard? Let us know by leaving a comment here, tweeting @geek_rex or talking with us on Facebook!